Damascus affirmed on Wednesday that the US recent claims against Syria demonstrate lack of principles, values, wisdom and rationality, adding that the chemical weapons’ pretext is an unsubstantiated flimsy argument to target Syria. Speaking to SANA, an official source at the Foreign and Expatriates Ministry said that the reckless escalation by the US is not a surprise as it comes from a country that has sponsored and is still sponsoring terrorism in Syria. It is no surprise that the US regime which has served as an air force for Daesh (ISIS) terrorists would rush to shore up terrorists in Ghouta and advance their fabrications. “If the US regime and its allies, namely the France and UK, believed that their actions and statements would stop the fight against terrorism in Syria, they are mistaken. 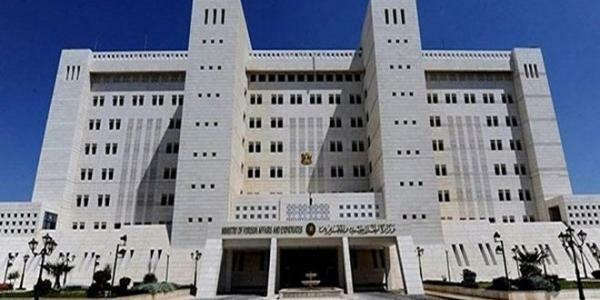 The Syrian state will continue to counter terrorism,” said the source. The source noted that recent acts of US regime indicates its lack not only of principles and values but also of wisdom and good sense, which in itself is a threat to international peace and security. “Syria has welcomed any fair, impartial and non-politicized commission of inquiry, which absolves the Syrian state of any involvement in using chemicals,” according to the source.